Rolls-Royce's new Malaysian dealer is strategically positioned within easy access of Kuala Lumpur's main thoroughfares. Rolls-Royce Motor Cars opened its first showroom in Malaysia. The new facility is located in Petaling Jaya, Kuala Lumpur. 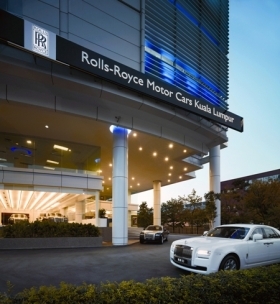 It is the British ultraluxury brand's 18th showroom of Rolls-Royce in the Asia Pacific region. The new showroom houses three Rolls-Royce cars and has a lounge that allows customers to configure their car using color, wood and leather samples from the company's manufacturing plant at Goodwood in southern England. "We continue to invest in a Malaysian market buoyed by the country's economic growth and growing appetite for super-luxury cars," Paul Harris, Rolls-Royce Motor Cars Asia Pacific Regional Director, said in a statement at the showroom's opening.